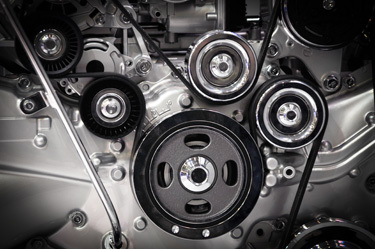 Many vehicle engines have a timing belt install, although some vehicles have a timing chain and sprocket arrangement. What is a timing belt? It’s an important vehicle part that’s got teeth that weaves accurately to its mating sprockets. This uniformity in teeth and spacing is extremely important. The teeth are exactly-molded out of special rubber compound to ensure long life. The stretch-resistant qualities are the result of toughened cords that run similar with the route of the belt travel. When it comes to the timing belt, it keeps up the synchronization of the crankshaft to camshaft as well as ensuring the valve operation matches the piston position. With some engines, it’s the driver for other important parts – balance shifts, water pump and oil pump. Be sure you look over your vehicle’s owner manual to find out when to do maintenance on your timing belt, usually recommending a specific mileage to replace your belt. If not done, the belt may break, leading to major engine damage and you without a vehicle. When you have the belt replaced, you may want to replace other vehicle parts at the same time – timing belt sprockets, tensioning and water pump. Give The Garage Auto Repair a call today at (918) 806-2709. We look forward to serving you!